We're changing the way human services are delivered. Today, state and county adult & aging, child support, child welfare, and economic assistance programs and caseworkers face an uphill battle. With increasing caseloads, shrinking budgets, and caseworker turnover always looming, their need to accomplish more with less is greater than ever. Unfortunately, the outdated, paper-based systems that many agencies use make this nearly impossible. 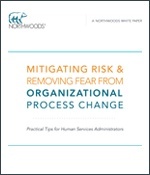 Northwoods software solutions enable them to dramatically reduce the paperwork burden, mobilize caseworkers and improve productivity agency-wide. As a health and human services agency director, you have growing demands on your agency’s time and resources from clients, social workers, caseworkers, clerical staff, lawyers, and the community at large. As a child welfare administrator, you are responsible for assessing clients' risk levels, protecting clients’ safety and property, gathering evidence to substantiate abuse, assessing the need for services to reduce risk, and crisis intervention. As an economic assistance administrator, you need to make sure eligibility requirements are properly explained to clients, applications are getting processed accurately and efficiently, and the correct services are getting assigned. As a child support administrator, your role is unique — from the basics of making sure custodial parents receive payment, to playing a supportive role to non-custodial parents. As an IT director, your responsibilities are never-ending — from developing an overarching IT strategy, overseeing security, and making sure your systems can scale, to managing compliance issues, and implementing shared service models. It’s no secret that finance directors within human services agencies across the U.S. are continually being asked to do more with less. When caseloads increase and staff turns over, economic assistance caseworkers often feel the greatest brunt. They face constant deadlines to process applications for new benefits, complete re-certifications, and update clients’ information, yet they often can’t access or find the information they need, when they need it.